UltraBoosts are already a staple in every closet. Whether you’re a collector, hypebeast, sneakerhead, a runner, or if you just value comfort. So what happens when one of your favorite silhouettes gets a decked out makeover? And with none other than the Japanese streetwear brand, BAPE? The newest in Bape sneakers will don your favorite Bape Camo print. 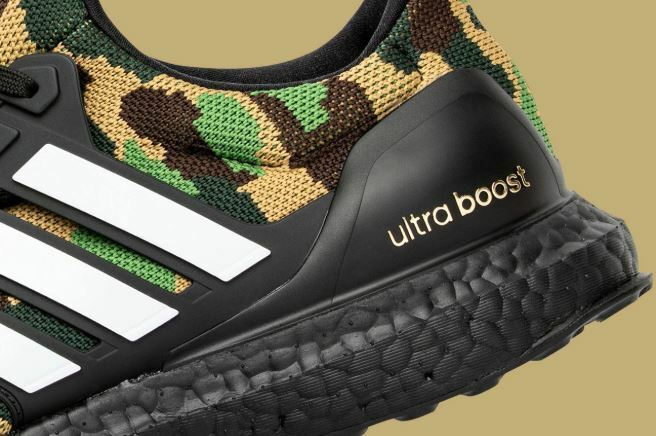 Make room for the Bape Adidas UltraBoosts dropping just in time for the Super Bowl. Founded by Nigo in 1993, BAPE, aka A Bathing Ape, is a Japanese clothing brand that is now 26 years strong. While its journey began in the 90s, it isn’t until the 2000s that Bape sneakers came into full force. And speaking of force, the Bape sneakers line, the Bapesta, draws heavy inspiration from the Nike Air Force 1. However, Bape works on a lot of other sneakers besides its own. Bape does not shy away from collaborating with any brand (like the Bape x Pepsi collab). It will jump from brand to brand making mindblowing collaborative creations that everyone wants to get their hands on. Not only is Bape involved in sneakers and clothing, but you can even find Bape camo blankets. Bape is making its way into being a part of your lifestyle, yet you barely know it! Bape and Adidas are longtime collaborators. In fact, the Adidas Bape collaboration homes some of the most notable Bape sneakers. Since 2003, Adidas and Bape have worked together on several projects most of which were very hard to cop. Now, the two are joining forces to bring Super-Bowl gear that’s full of that Bape camo print we all love and revere! Scheduled for February 2, 2019, the Bape Adidas UltraBoosts will drop in two colorways of the iconic Bape camo print. The Bape Camo is inspired by Japan’s fascination in military fashion. Many streetwear brands utilize military aesthetics in their lines, from combat boots to military-inspired jackets. This Bape camo is to Bape as the Bogo is to Supreme. The shoes’ two colorways are black camo and the traditional green camo, which will also include Bape’s trademark gorilla head. In addition, there will be an American flag-inspired gorilla on the tongue and 3M stripes. The Bape sneakers will drop as part of a limited edition collection that will get you ready for the game! Dropping alongside the sneakers are a game-ready branded football, football helmet, SB jersey, SB tights, arm sleeves, Adidas Bape shark hoodie, cleats, and Bape Adizero gloves. The collection will be available globally via Adidas.com and Bape flagships. IT’S OFFICIAL. the most anticipated collection has arrived.